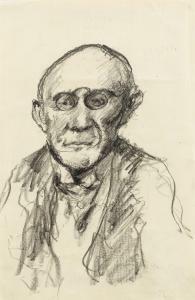 Find artworks, auction results, sale prices and pictures of Lovis Corinth at auctions worldwide. Lovis Corinth ALFRED UCKELEY - RECTO ETUDES DE TÊTES ET PERSONNAGES COSTUMÉS - VERSO 1858 - 1925 indistinclyinscribed 80 X/28 (upper right) - recto bears the Lovis Corinth studio stamp and numbered 338- verso charcoal on paper 50.1 by 32.5 cm; 19 4/5 by 12 4/5 in. Kusthandel Wolfgang Werner, Berlin Acquired from the above by the present owner in 2011 Catalogue Note The authenticity of this work has been confirmed by Thomas Deecke. LOVIS CORINTH Selbstbildnis. Etching, 1914. Signed and numbered 5/25 in pencil, lower margin. 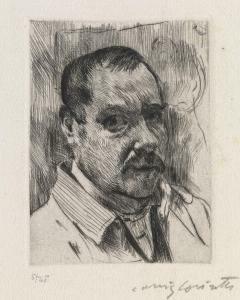 With—Thomas, drypoint, 1922. Signed in pencil, lower right * Henny Porten, drypoint, 1923. Signed in pencil, lower margin. Very good impressions. Various sizes and conditions. Schwarz 160, Müller 580 and 677. 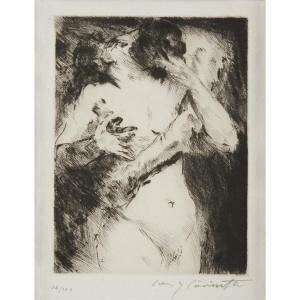 LOVIS CORINTH (german, 1858–1925) "DER KUSS (THE KISS)" Circa 1921, pencil signed and numbered 36/100 bottom left. Drypoint on soft wove paper. Image size (sight): 9 x 6 3/4 in. (22.9 x 17.1cm) Sheet size (sight): 10 3/4 x 8 in. 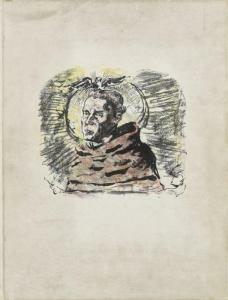 (27.3 x 20.3cm) provenance: Jorg Mass, Berlin, Germany. Collection of Jeffrey M. Kaplan, Washington, D.C. (acquired directly from the above in 2007). Corinth, Lovis (German, 1858-1925). 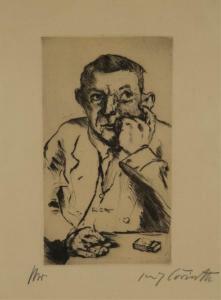 "Männliches Bildnis mit Aufgestütztem Arm" [Portrait of a Man Smoking]. 1916. Drypoint etching in black on wove paper. Signed in pencil, l.r., marked in pencil, l.l. Schwarz/Muller, no. 237. Plate: 7 13/16" x 4 9/16" Framed: 23 1/2" x 19 1/4" Condition: Under glass, not examined out of frame.